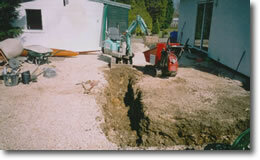 Excavation, Groundworks Preparation, Construction Services: Gloucestershire, Herefordshire, Wiltshire and Worcestershire areas. 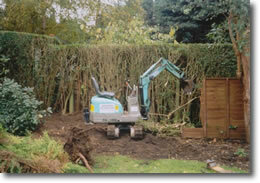 Hire a skilled professional to undertake those back-breaking excavation jobs in the garden! Awkward Excavations' digger operator is experienced in all aspects of groundwork preparation and can complete the job in a fraction of the time it would take to do it manually. 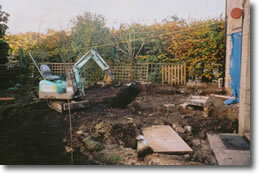 I also have larger diggers available for bigger groundworks preparation, where there are no access restrictions. I am also fully insured for your peace of mind. Building and hard landscaping service. Why struggle with self-drive plant hire? I am an experienced digger operator and so competitively priced that it is hardly worth hiring the equipment from the local plant hire shop. 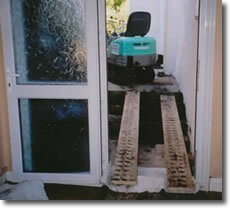 I can often have the work finished in the time it would take you to familiarise yourself with the controls. Despite their size, mini-diggers are very powerful and can be dangerous pieces of machinery in the wrong hands. Garden on the side of a hill? 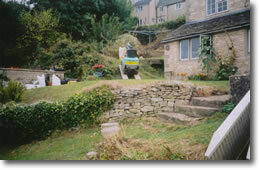 Awkward Excavations' mini-digger is highly manoeuvrable and can negotiate steep inclines and even steps. 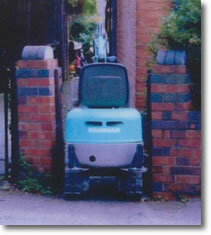 My micro or mini-digger is just 27” wide (that’s 680mm) making it ideal for restricted access - gardens, doorways, gates, etc. I can even drive it through a house if necessary (cleaned up, of course!). 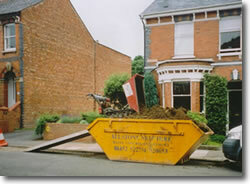 All spoil can be loaded onto a skip for removal if required, using a motorised mini-dumper truck. Site or garden will be left tidy. Domestic and trade work undertaken.